According to The Hill, the National Gay and Lesbian Task Force today will deliver a letter to Senator Barbara Boxer and Sen. John Cornyn, the Republican vice chairman of the ethics panel, claiming that the committee has singled out Craig for investigation because his behavior is homosexual while ignoring equally repugnant behavior by heterosexual Senator David Vitter of Louisiana. Vitter’s name was found in the records of Deborah Jeane Palfrey, the D.C. Madam, and since then, according to The Hill, “allegations have surfaced that Vitter consorted with prostitutes in New Orleans. Jeanette Maier, who was convicted in 2002 for running a brothel, has claimed Vitter was a client.” Vitter has been an outspoken defender of “the sanctity of marriage”. 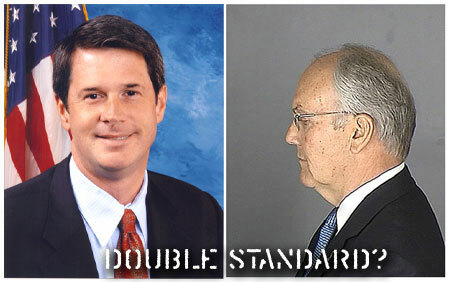 An ethics probe of Vitter has yet to be launched. The Hill says that the NGLTF sees it as evidence of a “witch hunt motivated by the homophobia of GOP Senate leaders.” The group is demanding a response. The Hill notes that although there has been no investigation of Vitter he did receive a standing ovation from the Senate Republican Conference after apologizing for the DC Madam allegations.